Wildfires raged through seaside resorts near the Greek capital, torching homes, cars and forests and killing at least 74 people, authorities said Tuesday. Twenty-six of the dead were believed to be groups of families or friends who were found huddled together, some of them hugging. Rescue crews were searching the charred remains of homes and cars in the deadliest of the fires, the one in the Rafina area northeast of Athens. The number of victims appeared set to go even higher, with crews checking charred homes and vehicles and the coast guard scouring beaches and deeper waters. There was no definitive count of the missing. Fueled by 80 kph (50 mph) winds that frequently changed direction, the fires — one to the west of Athens near the town of Kineta and another to the northeast near the port of Rafina — spread at speeds that surprised many, trapping hundreds on beaches and cutting off escape routes. All the casualties appeared to be from the fire near Rafina, a popular seaside area that is a mix of permanent residences and vacation homes. The blaze broke out Monday afternoon during a hot, dry spell but the cause was not immediately clear. Aerial photos showed charred swathes of forest and homes. Prime Minister Alexis Tsipras declared three days of national mourning. Apart from the dead, which included children, hospitals treated 187 people, most for burns, with 10 listed in serious condition. Although it had abated by Tuesday afternoon, the blaze was far from extinguished and more than 230 firefighters were still trying to put it out, helped by volunteers and water-dropping aircraft. Another five fires continued to burn, with flare-ups reported in the blaze near Kineta. 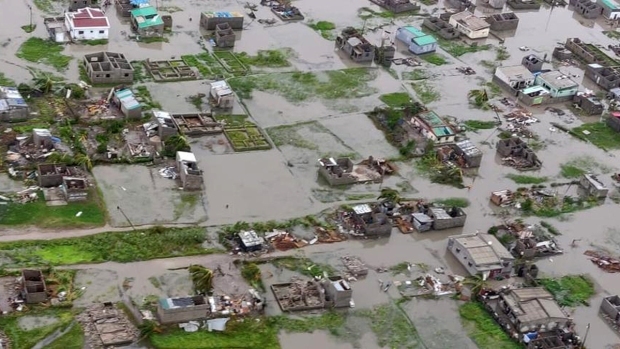 Authorities ordered the evacuation of some communities as a preventive measure. Authorities urged the public to contact them about the missing. Many took to social media, posting photos and what was believed to be their last location before the fires hit. Hundreds of homes and cars were believed to have been burned. Many vehicles were found with the keys still in the ignition and doors open, a sign of the urgency with which their occupants sought to flee the flames. Narrow roads quickly became jammed, forcing many to try to escape on foot. The ferocity of the fire melted cars' metal hubcaps. Many ran to beaches, but even there the fire got so close and the smoke was so thick that dozens swam out to sea despite the rough weather. Coast guard and private boats picked up more than 700 survivors from beaches and the sea — but also recovered six bodies. "It happened very fast. The fire was in the distance, then sparks from the fire reached us. Then the fire was all around us," said Nikos Stavrinidis, who had gone with his wife to fix up his summer home for a visit by his daughter. Stavrinidis, his wife, and four friends swam out to sea to escape the smoke, but they quickly became disoriented, losing sight of shore and being swept out farther by the wind and currents. Two of his group didn't survive. "It is terrible to see the person next to you drowning and not being able to help him," Stavrinidis said, his voice breaking. The rest of the survivors were picked up by a fishing boat with an Egyptian crew who jumped into the water to rescue them. Rafina's dock became a makeshift hospital overnight as paramedics examined survivors, some wearing only their bathing suits, after being dropped off by rescue boats. Rafina Mayor Evangelos Bournous said his home had burned down and his family escaped by going into the sea. The speed of the fires caught many by surprise. "Everything happened in seconds," said Andreaas Passios, who lives next to the compound in Mati where the 26 bodies were found. "I grabbed a beach towel. It saved my life. I soaked it, grabbed my wife and we ran to the sea." Passios said he and his wife stayed by the sea for two hours. "It was unbelievable. Gas canisters were exploding. Burning pine cones were flying everywhere," he said. Among the survivors was former Greek Communist Party leader Aleka Papariga. "The police tried to direct us away from the fire, but we couldn't escape it," she said. "We got stuck in traffic and the flames were on top of us. We managed to find a small gap and we made it out." Local officials provided housing, food and clothes for those affected. Greece sought help in fighting the fires from the European Union. 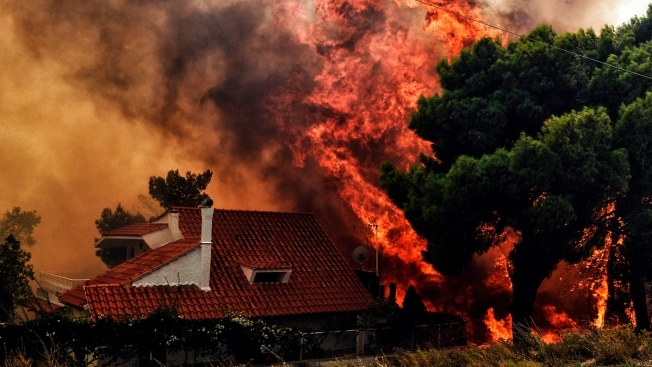 Spain sent two firefighting aircraft, while Cyprus sent in 60 firefighters. Israel, Turkey, Macedonia, Bulgaria, Croatia, Italy and Germany also offered assistance. Over the two days, 47 brush and forest fires broke out across Greece, with most of them quickly extinguished, the fire department said. Heavy rain was forecast Wednesday across southern Greece, and there was hope that could help firefighters. Forest fires are common during Greece's hot, dry summers and temperatures recently reached up to 40 degrees Celsius (104 Fahrenheit). In 2007, more than 60 people were killed when huge fires swept across the southern Peloponnese region. Associated Press writer Costas Kantouris contributed.